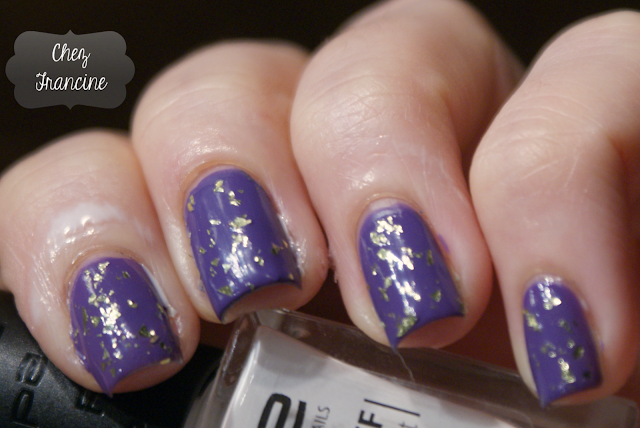 Today I'm going to share with you a must have product for avery glitter lovers out of there, P2 Peel-Off base coat. A peel-off base is something pretty similar to a school glue but much more easier to use. I've received this one for review, and I've used it many times in the last month. P2 Peel-Off base is very easy to use. Just lay it down to your nails and wait until the white coat shall turn transparent (around 10 minutes) and then you can unleash yourself and starting polishing your nails. It's very easy to remove too. Just plunge your fingers into a romm temperature water and wait few minutes before: when the pee-off base will have liflted up, you could easily tearing it away in one, single piece. This Peel-Off base is a must have for messy nail arts too, like gradients, stampings, splatter manis and such, but it doesn't work for watery manicures as water marble, water potted and so on, because the base melts when wet. I've tried this option too, for the nail art you could see in the picture below (coming soon), and it didn't work. Questa base è ottima anche per quelle nail art incasinatelle come gradient, stamping, splatter e via dicendo, ma non funziona a contatto con l'acqua, perché si scioglie senza pietà. Ho provato quest'opzione con la nail art qui sotto (coming soon), tanto per, ma ovviamente non ha funzionato. Be careful, because the peel-off base is a little bit sticky when is wet. Keep your fingers far away from each other and watch some sit-coms or... read my blog! Vi consiglio di fare attenzione durante la fase di asciugatura, perché la peel-off base è molto appiccicosa. Nell'attesa, guardatevi qualcosa di breve in tv (una sit-com) oppure... leggete il mio blog! Let me know if you have had the chance to try some P2 Cosmetic products, you know I like chit-chat with you!